To the venue, Tsudanuma Campus of Nihon University, 1) Keisei-Okubo station(KS27) and 2) JR-Tsudanuma station are the nearest. 1-1) To Keisei Okubo station(KS27) from Narita Airport, please do not take Sky Liner nor Access Express (if you go to Nippori, Ueno or Tokyo central area, it is rather convenient to take those) but take Keisei Main Line for Ueno. If you take Ltd. Express, get off at Yachiyodai station(KS29) and change into the local train for Ueno. Keisei Okubo station is 2 stops ahead from Yachiyodai station. From Narita Airport Terminal 1, the train runs every 20 minutes (07,27, 47) in day time (10:00-21:00). Before 10:00, you can take Rapid Express or Rapid for Ueno. * For the participant who stay at the hotel located at Katsutadai and Yukarigaoka, you can reach your hotel in the same way. For Katsutadai(KS31) , you can arrive there exactly in the same way(taking Ltd. Express or Rapid Ltd. Express, Katsutadai is one station before Yachiyodai). For Yukarigaoka(KS33), if you take Ltd. Express, get off at Sakura(KS35) and change in to the rapid or local train. Yukarigaoka is two station ahead from Sakura. 1-2) To Keisei Okubo station(KS27) from Haneda Airport, take Airport Express or Airport Rapid Express of Keikyu Line (not mono rail) for the direction Shinagawa(KK01), Asakusa(A18) or Narita(KS40). Change at Aoto(KS09) or Keisei Takasago(KS10) station into the Keisei Main Line for the direction Keisei Tsudanuma and Narita. If you take the rapid train, you can directly come to Keisei Okubo(KS27) without change. If you take the Ltd. Express or Repid Express, you have to change at Keisei Tsudanuma(KS26) into Local train for Usui or Narita. Keisei Okubo(KS27) is one station ahead from Keisei Tsudanuma. Or also you can take the limousine bus to Keisei Tsudanuma(KS26). Keisei Okubo(KS27) is one station ahead from Keisei Tsudanuma. * For the participant who stay at the hotel located at Katsutadaii(KS31) , you can arrive there in the same way. Every train except morning/evening liner stops at Katsutadai. Katsutadai is two stops ahead using Ltd. Express and five stops ahead using rapid or local train, from Keisei Tsudanuma. For the participant who stay at Yukarigaoka(KS33), if you take rapid or local you can reach there without change. But if you take Ltd. Express, please get off at Katsutadai(KS31) and change into rapid or local train. Yukarigaoka is two stops ahead from Katsutadai. 1-3) From Keisei Okubo station, it takes 10 minutes on foot. At the ticket gate and on the way to the venue, some ACED staffs are there and show the way to the venue. 2-1) To JR Tsudanuma station from Narita Airport, please do not take Airport Express (If you want to go to Tokyo central area directly, it’s rather convenient to take this) but take rapid train for Kurihama, Yokosuka, Zushi, Ofuna or Tokyo. You can reach JR Tsudanuma without change. JR Tsudanuma is two station ahead from JR Chiba station. 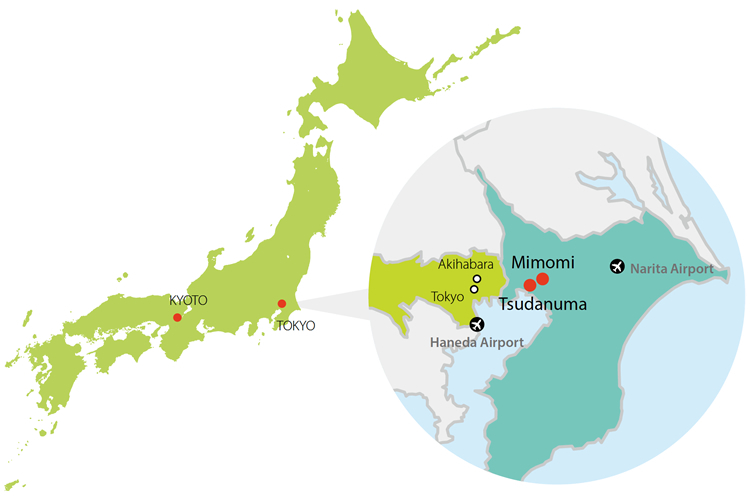 It takes approximately one hour from the airport to JR Tsudanuma station. If you take the local train for Chiba, change at Chiba into the Yellow line (platform 1 and 2). It takes approximately 15 minutes from JR Chiba to JR Tsudanuma. * For the participants who stay at the hotel at Makuhari-Hongo (Maple Inn), please change at Chiba into yellow line(platform 1 and 2) and get off at Makuhari-Hongo station, that is one station before JR Tsudanuma. 2-2) To JR Tsudanuma station from Haneda Airport, we recommend to take limousine bus for JR Tsudanuma. If you want to take railway, take the Keikyu Line for Shinagawa first, and change into Sobu-Yokosuka line for direction Tokyo then get off at JR Tsudanuma. It takes approximately 40 minutes from Shinagawa to Tsudanuma. * For the participants who stay at the hotel at Makuhari-Hongo (Maple Inn), please change at Tsudanuma into yellow line (direction for Chiba). Makuhari-Hongo station is the next station of JR Tsudanuma. 2-3) From JR Tsudanuma station, take the bus from the bus station of north exit of JR Tsudanuma station. There are ACED staffs at the ticket gate, concourse, and at the bus platform. It takes 10-15 minutes from JR Tsudanuma line. Get off the bus stop at Nichidai Seisan Kogakubu Mae (Ninon University), which is two stops ahead from the hospital. Tokyo Disney Resort is 30 minutes away.